Should You Dump Your Junk on Google Drive? Cloud computing is one of those trendy terms that people throw around liberally these days, even if they don’t quite understand what it means. In its most basic sense, an online cloud is a collection of remote computers that are accessible from nearly any location and that can either perform a task or store data. Google’s new Drive service is the latest example, but chances are you’ve been using a cloud for years. Use Gmail, or any other web-based mail system? Then you’re already knee-deep in cloud computing. Store files on a service such as Dropbox? Same thing. Keep your photos online in Flickr? You guessed it, cloud again. So, why is the new Google version so important? Dropbox, Microsoft’s SkyDrive, and others have offered similar services for years. Google Drive is newsworthy because a huge number of people already have Google accounts and use Google services, so chances are all you have to do is surf over to drive.google.com to get started. 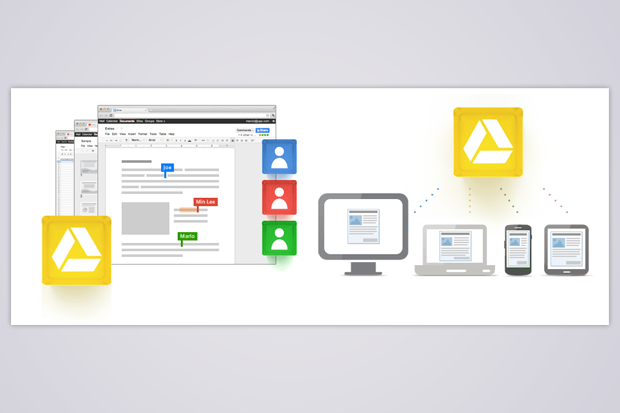 The collaboration and sharing features of Google Drive make it easy to pass a document around, and Google will automatically save older versions of your files for 30 days in case you screw anything up too badly. Yes, it’s all standard business legalese (for example, Google is not going to take the novel you’ve been writing in Google Docs and claim they own the movie rights), but it’s worth taking note of the issues that come up as we share more of our personal information and store more of the things we produce online. 1) Easy to use — if you have a Gmail account, for example, you’re already signed up. 2) 5GB of free storage — it’s not enough for even a single DVD-quality movie, but it’s pretty good for documents and photos. 3) Easy collaboration — share file access with others to allow them to edit and update your documents (a lot of these articles have been written via shared Google docs). 4) Access nearly anywhere — Including any PC or Mac web browser, Android devices, and iPhones and iPads via a coming-soon app. 1) Not great for media — with only 5GB of space, your music collection won’t fit here (Amazon offers a great cloud storage locker with lots of space for music). 2) Not the best layout — like Gmail, Google Drive eschews traditional folders and sorting options, which can be confusing. 3) The fine print — there has been some concern over the fine print of the Google Drive service agreement with regards to privacy and ownership issues.